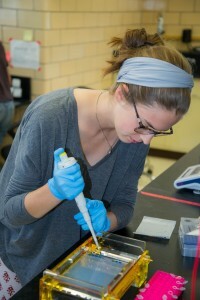 This post is by Okemos High School student Maddie Stover working in Dr. Ashlee Rowe’s lab in the Neuroscience Program & Department of Integrative Biology at MSU. A particularly effective nervous system makes the four-inch grasshopper mouse quite a fearsome desert creature, especially if you are an arthropod. Not only do these rodents howl to defend their territory and stalk their prey like big cats, but they hunt venomous scorpions, centipedes, and tarantulas. Yet these arthropod preys are not without a strong defense; their venom contains potent neurotoxins that are designed to both incapacitate and induce intense pain in their predators. In an evolutionary arms race, grasshopper mice (Onychomys​ spp. ), when compared to house mice, exhibit reduced sensitivity to the pain caused by bark scorpion (Centruroides​ spp.) venom (1). Our lab is investigating the molecular and physiological adaptations to the nervous system of grasshopper mice that confer resistance to bark scorpion venom. Three species of grasshopper mice are distributed throughout the deserts and prairies of North America; I study the Chihuahuan desert species, Mearns’ grasshopper mouse (O​. arenicola)​. Specifically, I am interested in the adaptations underlying their resistance to the venom of the striped bark scorpion (C​. vittatus)​. 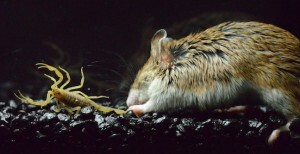 A grasshopper mouse attacking a bark scorpion. Photo by Dr. Matthew Rowe. Pain signals are transmitted to the central nervous system (CNS) by way of ion channels embedded in cell membranes. Sodium (Na+) and potassium (K+) ion channels play an important role in pain-signaling. As these channels are essential for many physiological processes they are very well conserved, such that a few amino acid substitutions can produce a significant change in the overall electrical activity of the channels. Bark scorpion venom contains low-molecular-weight proteins (toxins) that bind and manipulate ion channels, causing intense pain. Rowe et al. (2) previously showed that the Sonoran desert grasshopper mouse (O​. torridus)​ is resistant to the burning pain of its local prey, the Arizona bark scorpion (C​. sculpturatus)​, via amino acid changes to a pain-pathway Na+ channel (Nav1.8). Instead of inhibiting toxin binding to its target channel (Nav1.7), amino acid substitutions in O. torridus​ Nav1.8 enable the channel to bind a protein in C​. sculpturatus​ venom, ultimately blocking the pain signal the venom is trying to send to the CNS (2). However, O. arenicola a​ppear to be resistant to C. vittatus​ venom through an alternative mechanism. Since C. vittatus​ venom contains many K+ channel toxins, our lab is looking at the structure and function of O​. arenicola K​ + channels to determine whether changes in these ion channels confer reduced pain sensitivity to C. vittatus​ venom. A potassium channel consisting of an alpha subunit (red) and a beta subunit (blue). Pongs, O. & Schwarz, J.R. (3). In addition to providing an opportunity to study evolution at the molecular level, the grasshopper mouse model might also have interesting implications for chronic pain. Currently, opioids are the most common medication used to treat chronic pain. However, these drugs can have unpleasant side effects and become addictive. In order to develop better treatments for chronic pain, a more detailed understanding of the ion channels involved in pain-signaling is required. In the grasshopper mouse model we are able to study the physiological effects of structural variation in different types of potassium channels that regulate pain-signaling. When I first came to the Rowe Lab I was interested in how the structure and function of K+ channels contributed to the grasshopper mouse’s decreased sensitivity to toxin-induced pain. As I continued reading about these channels I found that K+ channels (the main pore region of which is called the alpha subunit) assemble with various auxiliary subunits. Beta subunits (a type of auxiliary unit) are cytoplasmic proteins that help regulate the channel’s electrical activity (3). Beta subunits are also the targets of certain scorpion toxins. At the Rowe Lab, I am studying whether K+ channel beta subunits contribute to the grasshopper mouse’s resistance to scorpion toxins. To investigate this question I sequenced two genes that encode K+ channel beta subunits from O. arenicola.​ I also cloned these genes so that we may coexpress K+ channel alpha and beta subunits in a heterologous system, and record the electrical activity of this channel complex. I found structural variation, when compared to house mouse orthologs, in both beta subunits I am studying. Currently, we are testing whether these structural changes have functional consequences for the K+ channel that contribute to grasshopper mouse venom resistance. I have had a great first experience with research at the Rowe Lab. All of our lab members have been important mentors to me and have taught me so much. 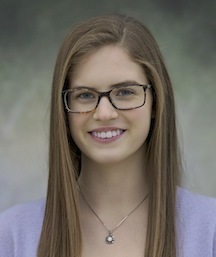 My lab helped me transition from a high school setting to a professional one (their patience, god bless) where I could learn skills that will be helpful in any area of work. I have learned that problem solving really is as big of a deal as they make of it on college websites and to never be ashamed to ask for help. I have learned that you really do regret what you do not write down, that white boards are the most important piece of equipment, and that I can really freak my grad students out by talking about my birth year. As previously stated beta subunits are small (the gene is around 2,000 base pairs long) when compared to alpha subunits (the gene is ~8,000 base pairs long). They are also quite new to molecular biology, as they were discovered in 1992. I suppose I am analogous to a beta subunit in that we are both relatively small and new to science. Rowe, A.H. & Rowe, M.P., 2008. Physiological resistance of grasshopper mice (Onychomys spp.) to Arizona bark scorpion (Centruroides exilicauda) venom. T​ oxicon,​ 52(5), pp.597–605. Rowe, A.H. et al., 2013. Voltage-gated sodium channel in grasshopper mice defends against bark scorpion toxin. Science,​ 342(6157), pp.441–446. Pongs, O. & Schwarz, J.R., 2010. 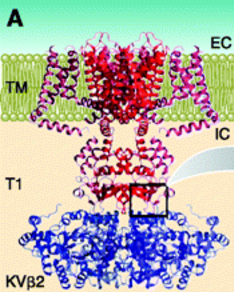 Ancillary Subunits Associated With Voltage–Dependent K+ Channels. P​ hysiological Reviews,​ 90, pp.755–764.